The Panasonic Lumix DMC-LX100 is a premium compact camera which incorporates a large Micro Four Thirds sensor. 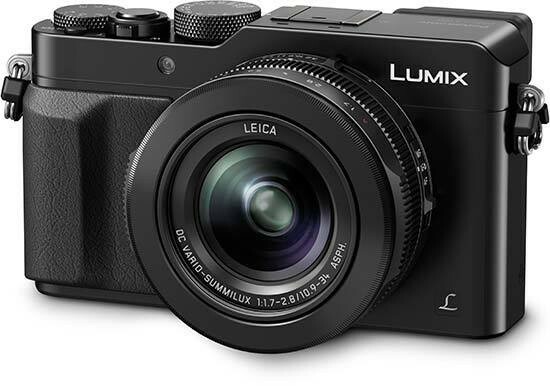 The Panasonic LX100 also features 4K video recording at 25/24fps including the ability to extract high-resolution 8MP images from the 4K video, a 24-75mm f/1.7-2.8 Leica lens, high-speed AF in approximately 0.14 seconds, built-in Live View Finder (LVF) with 2764K-dot equivalent high resolution, a 3.0-inch LCD screen with 921k-dot resolution, an ISO range of 100-25600, high speed burst shooting at 11 fps with the mechanical shutter and 40fps with the electronic shutter, aperture and control rings, and integrated Wi-Fi and NFC connectivity. The Panasonic Lumix DMC-LX100 is available in black or silver for £699.99 / $899.99. The new Panasonic Lumix DMC-LX100 is nominally the successor to the 2-year-old DMC-LX7 camera, but it includes so many technological advances that it's virtually unrecognisable from its predecessor. The main change is the inclusion of the same Micro Four Thirds sensor that's found in Panasonic's GX7 compact system camera. In terms of physical size, the 1.33-inch MFT sensor is significantly larger than the 1-inch sensors used in two of the LX100's principal rivals, the Sony Cyber-shot DSC-RX100 III and the Canon PowerShot GX7, and with 16.84 megapixels onboard, the pixel size is bigger too, all of which promises better image quality. The LX100 actually has a multi-aspect ratio sensor, so that it can capture 4:3, 3:2, 16:9, or 1:1 aspect images while maintaining the same focal length in each ratio, resulting in a 12.8 megapixel 4:3 image. Another important change is the inclusion of a built-in electronic viewfinder, again borrowed directly from the GX7. If ever there was a reason to end the debate about optical versus electronic viewfinders, this is it. Firstly, it has a staggeringly high resolution of 2764k dots, which translates into a display so good that you would swear it was an optical finder, helped in no small part by the high color reproduction of approximately 100% of the Adobe RGB colour-space, 100% scene coverage and 60fps refresh rate. Secondly, there's a handy sensor which automatically detects when the LX100 is held up to eye-level and even starts auto-focusing, with just the slightest delay until the display is ready. Thirdly, a whole host of information is displayed onscreen - virtually everything that you can display on the rear LCD screen can be shown in the EVF. Suffice to say that we didn't miss having an optical viewfinder when shooting with the LX100. The LCD screen on the rear is a bright 3-inch model with 921k dot resolution that provides a naturalistic translation of the scene before the lens. However you will still find yourself squinting and cupping a hand around it in bright sunlight, so much so that we shot almost exclusively using the EVF. Also sadly, the Panasonic Lumix DMC-LX100 doesn't have a touchscreen and the LCD isn't articulated in any way, two features that the GX7 compact system camera does offer and which we'd have liked to have seen on the LX100. As expected at this price-point, both Raw and JPEG files can be committed to SD/SDHC/SDXC or Eye-Fi cards, and conveniently both can be shot in tandem, with write speeds impressive at just two to three seconds. It further boasts a 3.1x optical zoom lens, offering a focal range equivalent to 24-75mm in 35mm terms, optically stabilized to help prevent image blur from camera shake and with a Nano Surface Coating to help prevent lens flare. Best of all is the fast f/1.7 maximum aperture, which in conjunction with the Micro Four Thirds sensor makes it easier to achieve DSLR-like shallow depth of field and out-of-focus backgrounds, whilst also proving invaluable when hand-holding the camera in low-light. In terms of auto-focusing, the LX100 has a couple of aces up its sleeve. The Full Area AF allows you to set the focus on any part of the 100% field of view, even right at the edges of the frame, while the focus detect area encompasses 49 zones. Furthermore, the Low Light AF system works in -3EV light situations, ensuring that auto-focusing works even in starlight. Focus Peaking is also new to the LX-series, if not to recent advanced compact cameras. When enabled, it graphically shows the peak of focus in the MF and AF+MF modes by displaying an outline around the subject. The detection level can be set to 'High' or ‘Low’ and a colour can be selected In ‘High’ these are light blue, yellow or green and in 'Low' blue, orange or white can be selected. Pinpoint AF mode is very useful for precisely focusing on a very small area, while, Manual Focus Assist automatically displays a 10x magnification to help you make sure that the subject is in focus in the MF mode. 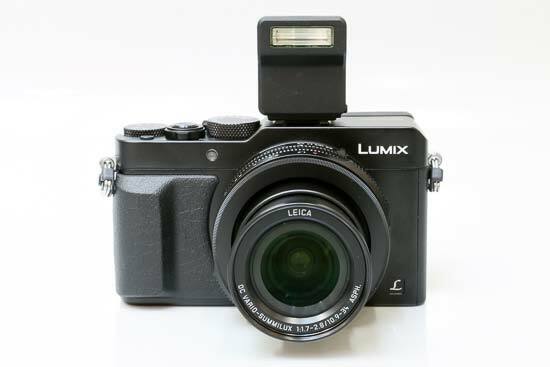 The Panasonic Lumix DMC-LX100 weighs a manageable 393g with the battery and card inserted, some 100g more than the LX7. Starting with the lens, there's a slider switch sitting atop the lens barrel for adjusting picture ratios. There's the option of selecting the standard 4:3 digital ratio to the right of the 'dial', with 3:2, 16:9 and, more unusually, 1:1, being the alternatives. Slide your left hand down and to the left of the lens surround and there's a further tactile switch for swapping between auto focus, macro focus and manual focus. An intuitive aperture ring additionally surrounds the lens which allows you to quickly change the aperture, with 20 1/3rd exposure steps available running from f/1.7 through to f/16. If you zoom to a focal length that slows down the aperture range, these physical markings obviously don't change - so at 75mm, for example, choosing f/1.7 actually sets the aperture to the fastest available value of f/2.8. Furthermore, changing the ring from f/1.7 to, say, f/2.2 has absolutely no effect on the camera's settings, as those apertures aren't available at 75mm. Other than this unavoidable quirk, the aperture ring is a great addition that further adds to the photographer-friendly feel of the Panasonic Lumix DMC-LX100. By default the new control ring quickly accesses stepped focal range settings of 24, 28, 35, 50, 70 and 75mm, although it can be reconfigured as a stepless zoom ring if you prefer, or to set the ISO speed, white balance or filter mode. While the zoom ring is a very welcome addition, it is a little on the narrow side, so much so that we occasionally found ourselves moving the aperture ring at the same time - an annoying consequence of the camera's small size. 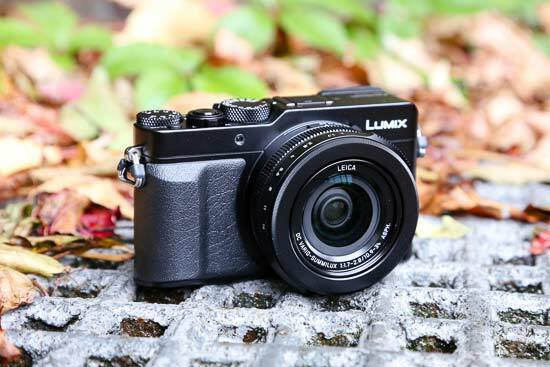 The Panasonic Lumix DMC-LX100's grip may not be particularly large but its leather-effect rubber padding further prevents the camera from feeling like it will slip from your grasp in a strong wind. Overall it comes across as a compact and elegant solution, with the body proportions measuring a manageable 114.8 x 66.2 x 55.0 mm, a little wider and deeper than the LX7. This therefore is a camera that will slip readily into a jacket or small bag, but not a trouser pocket. 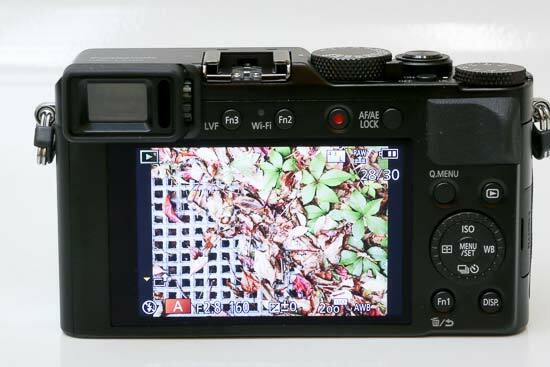 The MOS sensor greatly increases the camera's burst shooting options, with a fastest setting of 11 frames/sec when using the mechanical shutter or an incredible 40 full-resolution images when using the electronic shutter (focus and exposure fixed at the first frame). Slower modes of 6.5 frames/sec and 2 frames/sec complete with AF Tracking are also available. 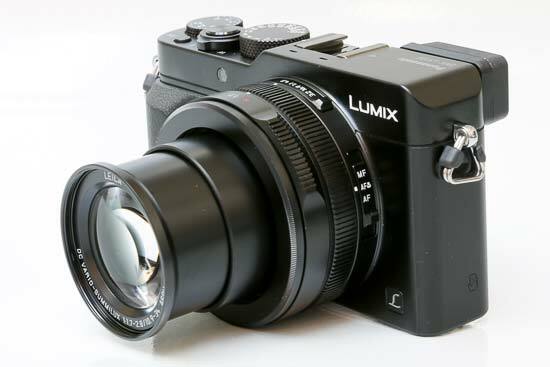 With the Panasonic Lumix DMC-LX100 we have other Lumix family regulars making a re-appearance. Selected via a dedicated button on top of the camera, there's the subject recognising and performance optimising intelligent Auto (iA) mode for point and shoot simplicity, with another button accessing an extensive range of Creative Control in-camera effects. Users also get access to six customisable Photo Style modes via the on-screen menu when the camera is in a creative mode, such as program, aperture priority, shutter priority or manual. There's a choice of auto and intelligent auto ISO settings, with a range that extends from ISO 100 up to ISO 25600 at full resolution, a nod to the sort of spec to be found on a semi-pro DSLR, so to be welcomed at a compact level. Also present and correct is the time saving 'Q.Menu' (Quick Menu) button on the backplate. Press this and a toolbar of essential shooting functions appears on screen that the user can tab through and make selections from courtesy of the cross keys and central 'set' button on the camera back. It's undoubtedly these familiar elements that will appeal to anyone trading up from say a FS-series Lumix compact, and soften any perceived learning curve from what otherwise outwardly appears a more sophisticated proposition. A flick of the top-mounted on/off switch and the LX100 powers up in two seconds. The LCD fades into life and the lens extends from within its protective housing to maximum 24mm-equivalent wideangle setting. Generally the camera is as fast and responsive as one could wish for. It's from the front and top that the Panasonic Lumix DMC-LX100 most shows its enthusiast targeting mettle, large (for a compact) 24mm wide angle Leica-branded lens staring you in the face as you tease the camera from its packaging. 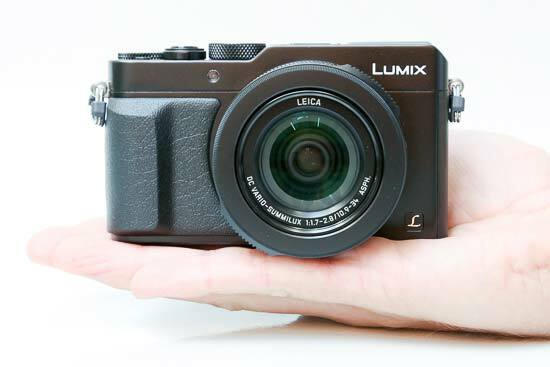 Unlike cheaper Panasonic compacts there's no automatic sliding lens cover to protect the glass when not in use, just a separate lens cap of the clip-on variety that may quickly get lost in a pocket. With the aspect ratio adjustment and focus mode sliders, aperture ring and focus ring encircling the lens surround as previously mentioned, above the lens and to its left is an AF assist/self timer lamp. On top we get that vacant hotshoe protected out of the box by a piece of plastic that also envelops the accessory port nestling just left of centre of the LCD, in front of which are the stereo microphones. The Panasonic Lumix DMC-LX100 doesn't have a pop-up flash - instead there's a small external flash supplied in the box which has a guide number of 7, seemingly an inevitable compromise to ensure that the LX100 remains so compact. Nestling next to the hotshoe is a dedicated shutter speed dial, which in conjunction with the aperture ring makes it a cinch to use the LX100 in full manual mode. Adjacent to this dial is the aforementioned on/off switch, and continuing the enthusiast-friendly design is another dedicated dial for setting the exposure compensation. The raised shutter release button is ergonomically encircled by a rocker switch for operating the zoom. As indicated the zoom glides fairly leisurely through its range, taking just over three seconds to get from maximum wideangle to extreme telephoto. Tabbing back and forth it's possible to be reasonably accurate with your framing. The Filter button houses the expanded and renamed Filter modes which give vent to the interior auteur. There are eight screens’ worth of digital effects on board selectable in this mode. These range from our particular favourite of the saturation boosting ‘Expressive’ colour through the sepia tinted ‘Retro’ and the more white-ish if slightly clumsily named ‘Old days’, and include the more self explanatory High Key, Low Key, a slightly unnecessary ‘Sepia’ (given the previous Retro and Old Days options), Monochrome, more high contrast Dynamic Monochrome and grainy film-like Rough Monochrome, Silky Monochrome, the high dynamic range ape-ing ‘Impressive Art’, a separate High Dynamic setting, Cross Process, a vignetting Toy Effect, a more luridly saturated Toy Pop, Bleach Bypass, Miniature Effect, Soft Focus, ‘Fantasy’ – bathing everything in a light blue-ish wash (a it like we’ve left the camera on ‘daylight’ setting) – plus Star Filter, One Point Colour and Sunshine setting – the latter of which mimics a burst of sunshine intruding from the top of your frame, so enlivening rather dull shooting conditions with the haze of a summer’s evening. On the rear of the Panasonic Lumix DMC-LX100 is the electronic viewfinder with diopter control, and alongside that a dedicated button for toggling between the LCD screen and the EVF. Alongside is the wi-fi button lets you use your smartphone to change the camera settings (focus setting, exposure compensation, ISO, WB and Photo Styles) and even fire the shutter button remotely (including interval video recordings), while the auto transfer function automatically backs up your photos onto a tablet. You can also use GPS data from your smartphone to record the shooting location onto your images. 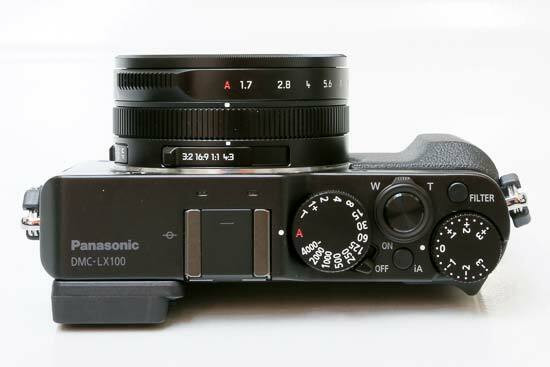 The LX100 is also one of the few compact cameras to feature NFC (Near Field Communication) technology (the same technology that's used for mobile payments), which allows you to connect it to a compatible internet enabled device or another NFC-enabled camera by simply tapping them together. Just right of this we have the recessed 'one touch' video record button that very usefully allows the user to be up and shooting video in a thrice no matter what other (non video) mode they might have selected on the adjacent dial. The LX100 offers both AVCHD video capture and MP4. Interestingly, if you want to shoot the maximum 4K video – i.e twice as high quality as Full HD – then a switch to MP4 mode is required before you can implement that setting on the Panasonic, with the choice 25 or 24 frames per second capture speed. In other words 4K shooting is not available with AVCHD compression. You can also extract a still image from a 4K sequence, ending up with the equivalent of an 8 megapixel photo at 30fps - impressive! The Panasonic Lumix DMC-LX100 is an intriguing prospect for would-be videographers, providing access as it does to the same creative exposure P,A,S,M modes selectable when shooting stills. You also get access to all the Photo Style and Creative Control modes when shooting video. ISO settings, white balance and AF tracking are also all accessible when shooting movies. The normal bugbear of exterior location shoots is also dealt with thanks to a wind cut option among the four screen's worth of menu settings in motion picture mode. Happily, the full extent of the smooth and steady optical zoom can be accessed when shooting video, its mechanical operation quiet and minimally intrusive. The LX100's Intelligent Auto mode works for movies as well as for still photos. Simply select the iA shooting mode on top of the camera, then the Movie Record button. The Intelligent Scene Selector automatically determines the most suitable Scene mode from five options - Portrait, Scenery, Low Light and Close-up or Normal modes. Face Detection automatically detects a face in the frame and adjusts the focus, exposure, contrast, and skin complexion. Intelligent Exposure continually checks the ambient light level and adjusts the exposure setting as conditions change to prevent blown highlights and blocked shadows. The Image Stabilizer helps prevent blurring from hand-shake when using a compatible lens or via the camera body. The Panasonic Lumix DMC-LX100 has a time lapse function in which you can set the time interval and the number of images to take, plus a multi-exposure option that lets you combine up to four exposures in a single frame, while the Stop Motion Animation mode allows you to create unique stop motion videos. Completing the row of buttons above the LCD screen is the enthusiast enticing giveaway of an AF/AE lock button. Underneath is the Quick Menu button and self-explanatory Playback button, and just below this a quartet of cross keys for tabbing through and selecting menu options, or scrolling through captured images, with a central menu/set button falling under the thumb in their midst. The top key of the quartet is marked ISO, which provides quick access to the extensive ISO range of 100-25600. To the right, at three o'clock, the next key is given over as a shortcut to accessing White Balance settings on the fly. The bottom key is for the LX100's burst shooting and self-timer options. At nine o'clock we get a button providing instant access to the AF Area settings. Beneath this again we get the final two buttons on the camera back, for self explanatory Display - a press of which turns of the operational icons or brings up a nine-zone compositional grid - and the Fn1 button. While that's it for the Panasonic Lumix DMC-LX100's backplate, the right hand side of the camera - when viewed from the back - features a terminal door covering both HDMI (cable optional) and AV/USB out ports. There are also vacant lugs on the left and right hand flanks of the camera for attaching the provided wrist strap. The base of the camera meanwhile features an off-centre screw thread for attaching a tripod, the other under-side feature being the compartment housing the battery, good for around 350 shots from a single charge, and SD/SDHC/SDXC or Eye-Fi media cards.